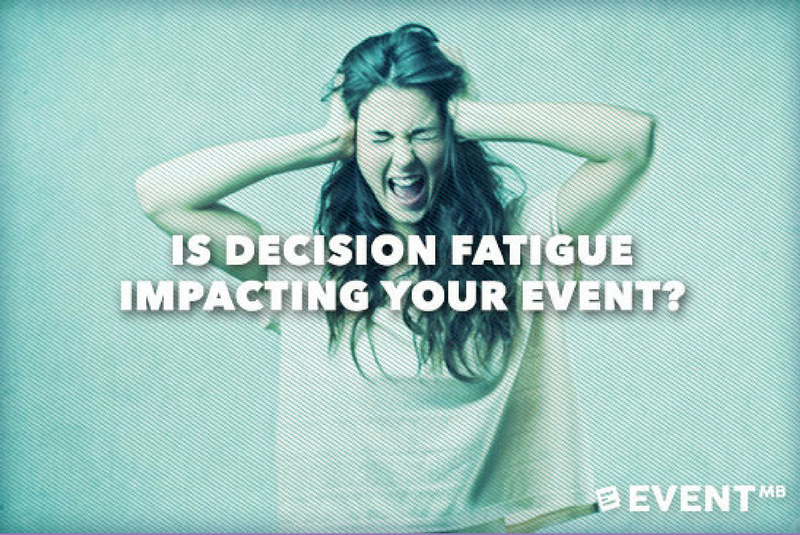 Is Decision Fatigue Impacting Your Event? Decisions, decisions, decisions! Whether we are working on logistics, financials, or event production, #eventprofs are constantly making an enormous amount of decisions. Do you ever find yourself paralyzed and overwhelmed, sometimes not even wanting to decide what to wear? Find out why this happens and what you can do to prevent what is known as decision fatigue. The term “decision fatigue” was coined by Dr. Roy Baumeister, Francis Eppes Professor of Psychology at Florida State University. His studies showed that the more decisions we make, regardless of their importance, the more our willpower decreases. This leads to poor decisions and performance. He described willpower as a muscle, which has the ability to get stronger through exercise, as well as proper sleeping and eating habits. There are also ways you can manage your decision fatigue throughout the day. After a long and busy day, have you ever had a dinner conversation that never gets finalized because nobody will make a decision about what to eat, where to go, when to go, or who is driving? Or maybe it’s one of those days when you can’t seem to make a decision about where to start, which often leads to not getting started at all. Have you ever had a super-busy and stressful week where your brain is fried, and you end up making a horrible decision at the end of the day (like gas station sushi, that extra candy bar, or that hideous blue and black dress - or is it white and gold?) These are examples of decision fatigue. Your body is mentally exhausted and needs a break from decisions. We make decisions all day long, without really considering it. Some are important, like hiring the perfect caterer. Others, such as what belt to wear, are not as important. But, decisions are decisions, and they begin as soon as you wake up…or decide to hit the snooze button once…or twice. It continues with deciding what to eat, how to cook it (or not cook it), what to wear, which way to drive to work, how fast to drive, or how slow to drive. On average, the normal person makes about 35,000 decisions each day! I am confident in saying that #eventprofs are not the typical, average person, and we routinely make more than 35,000 decisions in a day! As your decision fatigue increases, so does your willpower, regardless of if you are making a business decision or a dinner choice. While we can’t simply stop making decisions, there are some methods that we can follow to help manage decision fatigue. Do you have a morning routine? A specific route to work? While these may get boring at times, they can actually help you. Having a routine allows your brain to not have to make as many decisions, allowing it to be more prepared for the other decisions during your day. Even seemingly small decisions can add up and become overwhelming, which can impact your willpower or decision-making for more important decisions later in the day. Whether they realized it or not, successful individuals find ways to reduce their daily decisions. Steve Jobs wore the same type of outfit everyday. Mark Zuckerberg does the same thing. Even Albert Einstein was known to have fought decision fatigue by having several versions of the same outfit so he did not waste his brainpower each morning picking out his clothes! Not to compare myself to Albert Einstein, but I’ve been known to buy 5 of the same cardigan (in different colors), or a couple pairs of the same shoes in order to spare myself from future clothes shopping decisions! It also helps when all of your clothes match and can go with everything in your closet. That way, you don’t have to think about what you are wearing, but you know it will still look great! Make a list, prioritize, and eat the frog. Getting that to do list out of your head and onto paper allows your brain to relax a bit and not have to work on trying to remember everything. By making and prioritizing a list, you no longer have to continue to make decisions. They have already been made. If you prefer looking at a calendar, put in on a schedule. Regardless of your method, stick with it and use your list or schedule as a definitive task list. Brian Tracy, Best Selling Author & Success Expert used the following quote as the basis of his book, Eat That Frog! This was a quote he attributed to Mark Twain, but research has shown that it may have been misinterpreted throughout the years, actually being spoken by Nicolas Chamfort in the late 1700’s. Regardless, it is meant to motivate you to tackle your biggest challenge (or frog) of the day first. Eat that frog! If you have two frogs, eat the ugliest one first! In other words, take care of that project or task that you have been putting off. Your best decisions are often made in the morning, before you get bogged down with the other 34,999 decisions! By making it a point to work on the biggest “frog” first, you don’t have to struggle to decide what to do. Besides no longer fighting with yourself and putting that task off even longer, you will also feel relieved and accomplished! My favorite time to tackle tough tasks and “Eat that Frog” is first thing Monday morning. It’s sets me up for a productive week! As we discussed in a previous post, Gamify Your Stress, games are a great way to relieve stress. Studies have shown that some games can even help build up your mental resilience and willpower, ultimately decreasing your decision fatigue. Even in our tech-driven world, board games can be a great break, while at the same time stimulate your brain. If you prefer the electronic games, you could play games such as Lumosity, Elevate, SuperBetter, Scrabble or Words with Friends to stimulate your brain and increase mental resilience. At a conference last week, an event planner shared they they like to recharge with a simple game of Solitaire on the computer. Games can become part of your routine and can become a habit that helps you to relax and recharge, building your willpower for better decision making. Take a step back and evaluate the things that may be stressing you out. Are some of them unnecessary? What about your email inbox? How many of those emails can you unsubscribe from and truly not miss? Remember that each one of those emails require at least one decision. Do you delete it or keep it? Do you move it to a new folder? Do you mark it as unread to come back to it later? Do you leave it as read and hope to remember to come back to it later? If you are feeling overwhelmed with too many tiny details, try limiting your options. Simplify your choices. While this does actually involve making an extra decision to set the initial limits, it will still make the final choice easier in the long run. Eat healthy. Get Good Sleep. Exercise. As always, eating healthy makes us all better equipped to handle the stresses of the day. One of the most difficult times for me to have the willpower to eat healthy, get enough rest, and exercise is when I am getting closer to an event production date. Decisions for the event increase at a rapid pace and my willpower to take care of myself decreases. Be sure to take care of yourself during these critical times. If you don’t, your health, as well as your decision-making abilities will suffer. For some great tips on taking care of your health, check out some previous EventMB posts such as Foods for Lasting Energy or The Survival Guide for Long Live Event Days. We all have lots of decisions to make. All the time. As #eventprofs, it’s important to find ways to keep ourselves happy and healthy. By realizing how decision fatigue can affect you, and by using some of these tips to lessen the impact, you will be more prepared when those tough days come up. If you find yourself rapidly making lots of choices, give yourself a little break. Just remember - avoiding the decision is never the solution. Even not making a choice is still a choice.